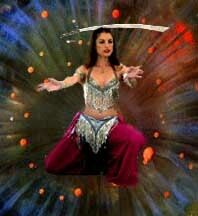 Belly Dance swords to make your dance exciting! Our well balanced belly dance scimitar is the perfect choice for professional and training dancers. Belly dance is a Western term for a traditional Arab dance genre that is known as raqs sharqi which means "oriental dance" or sometimes raqs baladi which means "country dance or folk dance". It is also sometimes called "Middle Eastern Dance" or the "Arabic Dance" in the United States. The dance which originated in the Middle East, is now popular around the world. Belly dance takes many different regional forms that vary both in costume and dance styles, indicating that distinctive dance moves may have been transported to these regions and incorporated with local dance styles. Belly dancing probably originated in Ancient Babylon in southern Iraq. It was a tradition for women to dance during social gatherings while men played the drums. Now you too have a chance to buy our light-weight scimitar to practice belly dancing. Many belly dancers bought it and they were very satisfied with it. Our scimitars have long been a favorite with dancers as these "dancing scimitars" allow the freedom of movement without the added weight of traditional swords. See the video of our belly dance sword in action! Special Thanks to Leilainia for the Video and Pictures!